The Pinwheel Galaxy is in the constellation of Ursa Major (also known as the Big Dipper). It is about 70% larger than our own Milky Way Galaxy, with a diameter of about 170,000 light years, and sits at a distance of 21 million light years from Earth. 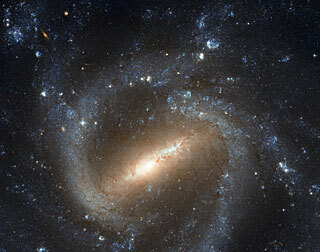 The NASA/ESA Hubble Space Telescope captured this image of the spiral galaxy known as ESO 498-G5. One interesting feature of this galaxy is that its spiral arms wind all the way into the centre, so that ESO 498-G5's core looks like a bit like a miniature spiral galaxy. This sort of structure is in contrast to the elliptical star-filled centres (or bulges) of many other spiral galaxies, which instead appear as glowing masses, as in the case of NGC 6384. 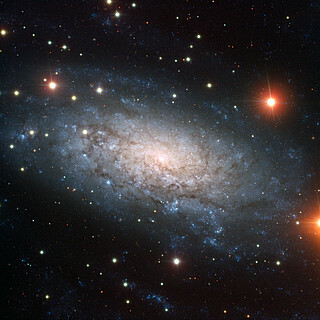 Astronomers have noted the widespread active star formation in NGC 253 and labelled it a "starburst" galaxy. The many bright clumps dotting the galaxy are stellar nurseries where hot young stars have just ignited. The radiation streaming from these giant blue-white babies makes the surrounding hydrogen gas clouds glow brightly (green in this image). There was some very important news recently about neutrino oscillation, which I wrote about here. Rather than go into the details there, it seemed better to put them in a separate article, and this is it. To recap, neutrinos are leptons, and like the better known leptons (electrons, muons, taus), neutrinos occur in three generations. The main characteristic that distinguishes the different generations of leptons is the quantum state called "flavor". Flavor is a quantum number that can, in principle, be measured. A neutrino is not necessarily in just a single flavor state; it can be in a quantum superposition of pure states. The flavor associated with a neutrino in a pure state is named after the corresponding lepton occurring in a particle interaction that creates or destroys the neutrino. Thus there are electron neutrinos, muon neutrinos, and tau neutrinos (denoted by νe, νμ, ντ, respectively). Neutrinos are created or destroyed only in particle interactions governed by the weak force – neutrinos do not feel the strong force at all. And since all neutrinos have no electrical charge, they do not feel the electromagnetic force either. However, as will be noted later, neutrinos have nonzero mass, so they feel gravitational force. For example, the decay of a free neutron (n → p + e- + ̅νe), creates a proton, an electron, and an electron antineutrino. This process is known as beta decay, since the electrons that come out used to be called "beta rays". The reverse process, inverse beta decay (̅νe + p → e+ + n), destroys an electron antineutrino, and can be used to detect antineutrinos indirectly by observing the positron that results. (The positron causes Cherenkov radiation in a liquid medium.) However, since neutrinos almost never interact with other particles, this reaction is very rare. It's estimated that a neutrino would have to pass through several light-years of solid lead in order to have a 50% chance of interaction with a lead atom. So hardly any neutrinos register in detectors, but fortunately there are so many of them that detection is possible. Electron antineutrinos are produced in copious quantities in nuclear reactors, because of beta decay and other nuclear reactions that yield the energy from a nuclear reactor. They are also produced in abundance from the nuclear reactions that power the Sun and most other stars. Indeed, attempts to measure the neutrino flux from the Sun are what first brought attention to the phenomenon of oscillation. The size of this flux was simply too small to account for the known energy output of the Sun. This discrepancy was known as the Solar neutrino problem. The problem was definitively resolved only just over a decade ago, when it was shown that the discrepancy was real, not simply an artifact of some inadequacy of detectors. The same discrepancy appeared in many quite different types of experiments, and a theory of neutrino oscillation that had already been worked out was able to account for the discrepancies. In a nutshell, flavor is a quantum number, so it is only known when it is observed. The weird thing is that what is measured may change every time it is observed, because flavor is not a conserved quantum number in weak force interactions. There is some probability of observing any of the three possible flavor states in any measurement. This is another way of saying that actual neutrinos are in a superposition – a mixing – of flavor states. The probability of observing a particular state also fluctuates over time. Since some antineutrinos that originated with electron flavor have another flavor when they pass through a detector, they can no longer interact in a way the detector is able to register, so they appear to be missing. Discrepancies were also noted in trying to count neutrinos originating from other sources, such as neutrinos produced in nuclear reactors. This problem affects all three neutrino flavors. Muon neutrinos are produced in muon decays, which affect muons produced naturally in the atmosphere by cosmic rays. Muons created in particle accelerators also produce muon neutrinos when they decay. Experiments that detect only muon neutrinos also find discrepancies. But what drives this oscillation? To better understand that, it's necessary to consider the other thing that distinguishes particles, including neutrinos, of the three different generations, namely mass. The Standard Model originally assumed neutrino mass was zero, but this isn't required, and the theory can be modified to allow neutrino mass. However, neutrino mass is extremely difficult to measure, because neutrinos react so infrequently with other particles. So mass measurements have to be made indirectly. Further, experiments to date have been unable to do more than place rather loose upper and lower limits on possible masses. As it turns out, though, neutrino oscillation studies do indicate the differences in the square of the value of mass for different mass states. Astrophysics provides some very rough indirect mass estimates. A crude estimation of neutrino mass can be deduced from the estimated amount of non-baryonic dark matter in the universe (about 26% of the universe's total mass-energy content). Conditions in the very early universe fixed the total number density of all 3 flavors of neutrinos at 3/11 the number density of cosmic microwave background photons. From that it can be estimated that even if all non-baryonic dark matter were in the form of neutrinos, the average neutrino mass could be at most ~4 eV. Since it seems likely that neutrinos actually make up at most a few percent of dark matter, an average mass limit of < 0.3 eV seems quite likely. For comparison, the rest mass of an electron of 511 KeV – a difference of at least 6 orders of magnitude. Gravitational lensing data from studies of galaxy clusters has provided a second estimate for the average mass limit – 1.5 eV. Muon and tau neutrinos should be far rarer than electron neutrinos, so the average mass will be strongly dominated by electron neutrinos. Muon and tau neutrinos could be much more massive without affecting the average significantly. A third even looser estimate, specifically for electron antineutrinos, comes from observations of Supernova 1987a. 24 electron antineutrinos were detected in association with that event. Although they were detected about 3 hours before the first visible light, this is explained by supernova models, which indicate that neutrinos will be emitted before most photons, since the neutrinos hardly interact with collapsing stellar material in the supernova, while photons interact strongly. Allowing for that, the time of flight for neutrinos from the supernova, which occurred at a distance of ~168,000 light years, indicates a velocity just enough less than the speed of light that the mass could be at most 16 eV. Experiments to measure neutrino mass directly take extended periods of time, due to the slow rate of detection, so all that can actually be observed is the time average of mass, when appropriate probabilities of each state are included. One relatively early measurement, the Mainz experiment of 1999, gave the expected value of mass of electron antineutrinos from beta decay as at most 2.2 eV, at the 95% confidence level. Discussing "the" mass of a neutrino at all is somewhat problematical, since mass is a quantum state, just like flavor is. So a neutrino is in a superposition of mass states before it is observed. There are three possible mass states, associated with each of the three neutrino generations, but they do not correspond directly to the flavor states. Instead, flavor states are related to mass states by a unitary matrix – the Pontecorvo–Maki–Nakagawa–Sakata (PMNS) matrix. There's one additional complication for observing a specific mass state when a measurement is done. Quantum mechanics describes quantum particles as waves of a certain frequency. This frequency is related to particle mass, because special relativity relates mass to energy by E=mc2, and energy is related to frequency by E=hν, where ν is frequency and h is Planck's constant. So mc2=hν, and if mass can vary from one observation to another, so can frequency. The net result is that different mass states propagate at different speeds, and the PMNS relation transfers this effect to flavor states. Interference between waves for different flavor states is the basic cause of neutrino oscillation. So the probabilities associated with observation of specific flavor states depend in a complicated way on the mass differences between the specific mass states, as well as a particle's energy and the distance it has traveled since creation. Here θ13 is one of the three parameters that describe neutrino oscillation, Δm231 is the difference in squared mass between the first and third mass state, and E is the neutrino energy (in MeV). Analogous formulas apply to oscillation of muon and tau neutrinos. Several things can be noted from this formula. Immediately after the particle is created, at L=0, the probability is 0 that its flavor has changed (because of the second sin2 factor). The probability varies with the distance that a neutrino travels, fluctuating periodically as L increases. It reaches a maximum every time L is such that the second factor is 1. The first factor determines what the maximum of the probability can be, and it will be nonzero if θ13 is. So θ13 ≠ 0 is necessary for oscillation to occur. It's also sufficient, as long as Δm231 ≠ 0. The are three possible differences of squares of mass states, but only two are independent, since, for instance, Δm231 = Δm232 + Δm221. These differences have been measured fairly precisely: Δm232 ≈ 2.32×10-3 (eV)2, Δm221 ≈ 7.59×10-5 (eV)2. These results don't tell a lot about the actual sizes of the mass states, except that they are all nonzero. Consequently all neutrino types experience oscillation, provided all the mixing angles are also nonzero too. In addition, there must be at least one mass state as large as √2.32×10-3 ≈ 0.048 eV. As for the mixing angles, sin2(2θ13) was just measured with decent precision to be about 0.092, and so θ13 ≈ 8.8°. Earlier measurements didn't determine θ13 to be nonzero with high significance, but the new result does, at 5.2σ. Previous measurements found sin2(2θ12) ≈ 0.861 and sin2(2θ23) ≈ 0.97, with corresponding angles 34.1° and 40.0°. 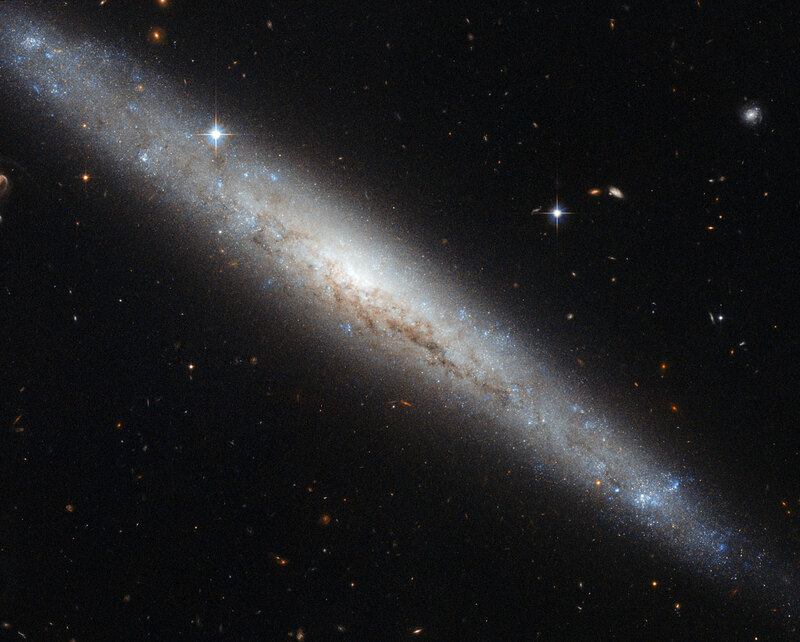 Most spiral galaxies in the Universe have a bar structure in their centre, and Hubble’s image of NGC 1073 offers a particularly clear view of one of these. Galaxies’ star-filled bars are thought to emerge as gravitational density waves funnel gas toward the galactic centre, supplying the material to create new stars. The transport of gas can also feed the supermassive black holes that lurk in the centres of almost every galaxy. 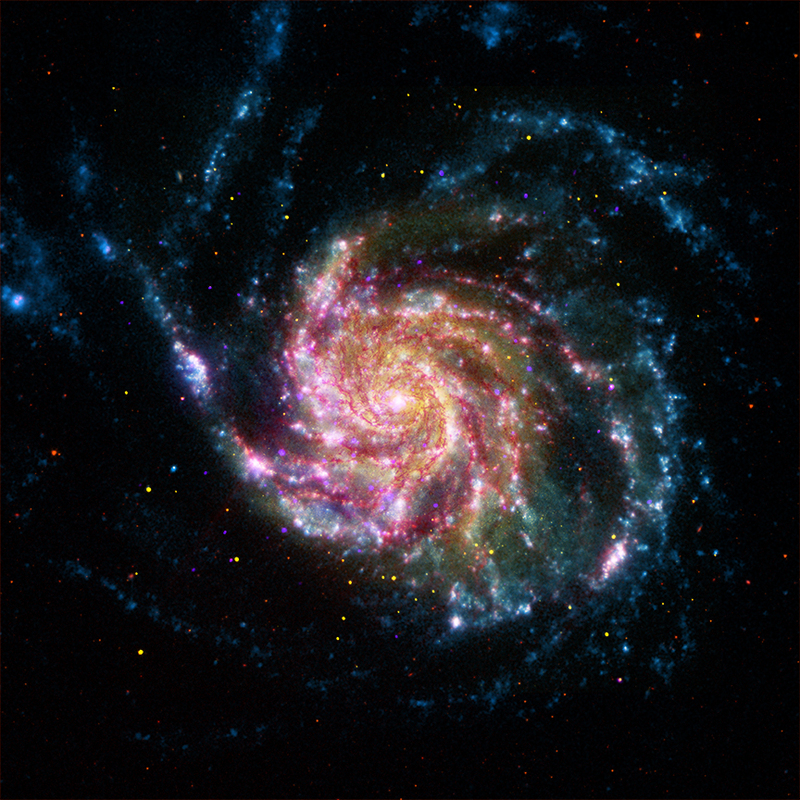 Some astronomers have suggested that the formation of a central bar-like structure might signal a spiral galaxy's passage from intense star-formation into adulthood, as the bars turn up more often in galaxies full of older, red stars than younger, blue stars. This storyline would also account for the observation that in the early Universe, only around a fifth of spiral galaxies contained bars, while more than two thirds do in the more modern cosmos. This image, from ESO’s Very Large Telescope (VLT), shows a truly remarkable galaxy known as NGC 3621. To begin with, it is a pure-disc galaxy. Like other spirals, it has a flat disc permeated by dark lanes of material and with prominent spiral arms where young stars are forming in clusters (the blue dots seen in the image). But while most spiral galaxies have a central bulge — a large group of old stars packed in a compact, spheroidal region — NGC 3621 doesn’t. 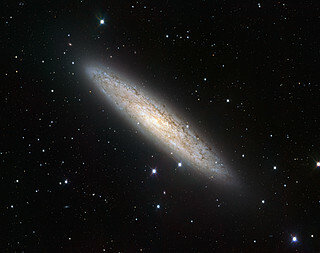 In this image, it is clear that there is simply a brightening to the centre, but no actual bulge like the one in NGC 6744 (eso1118), for example. NGC 3621 is also interesting as it is believed to have an active supermassive black hole at its centre that is engulfing matter and producing radiation. This is somewhat unusual because most of these so-called active galactic nuclei exist in galaxies with prominent bulges. In this particular case, the supermassive black hole is thought to have a relatively small mass, of around 20 000 times that of the Sun. All living creatures on this planet use the same 20 amino acids, even though there are hundreds available in nature. Scientists therefore have wondered if life could have arisen based on a different set of amino acids. And what's more, could life exist elsewhere that utilizes an alternate collection of building blocks? It really is rather remarkable that such a small subset of possible amino acids make up (almost) all the proteins in every known living organism on the planet. What enforces this strict discipline is the fact that all life forms on Earth use the same genetic code – a remarkable fact in itself – and this code does not specify any amino acids other than the same 20 ones. The way the code works makes substitutions impossible. The reason for this inflexibility lies in the nature of transfer RNA, which is a critical part of the process in which genetic information encoded in DNA is converted to specific sequences of amino acids making up proteins. The DNA sequence of genes is first transcribed (in a process that is actually rather complicated) into another form of RNA – messenger RNA. All forms of RNA consist of a sequence of nucleotides, with every 3 nucleotides grouped together into "words". Since there are 4 possible nucleotides, there are 64 (=43) possible distinct words. In a molecule of transfer RNA, which typically comprises 73 to 93 nucleotides altogether, the three nucleotides at one end will match the sequence of one particular word of messenger RNA. The other end of the transfer RNA can bind to covalently to only one of 20 possible amino acids, completely ignoring any other amino acids. For any particular one of the 20 amino acids there are usually several different transfer RNAs that the amino acid can bind to, with each type corresponding to a specific 3-letter sequence of nucleotides. In this way there is a established a many-to-1 relationship between the 64 3-letter nucleotide words and the 20 amino acids. This is the genetic code. The 20 amino acids can be considered as letters of another alphabet, in which sequences of letters (sometimes thousands of each) make up specific proteins. There are several interesting questions about this genetic code. Why are only 20 amino acids used, even though hundreds exist in nature? How did this small subset happen to be chosen – and be the same subset in all living organisms on Earth? If there is life on other planets that still encodes genetic information with DNA and RNA for making proteins, must the same 20 amino acids be used? There is a range of possible answers to these questions. At one extreme, the subset of amino acids could have come about completely at random, perhaps being the first viable subset that emerged by chance and them became "frozen" in all successor life forms. At the other extreme, it could be that the amino acids actually used are the only ones that are able to build a suitable set of proteins. The intermediate case is that very early in the history of life many different subsets were in use, but in a process of evolution over time, the subset now used proved to be sufficiently superior to all others that it is the only one that survived in the conditions of the time. Stephen Freeland and Gayle Philip performed a computer study to investigate whether the exact subset of 20 amino acids in the alphabet were more likely to be a completely random selection, or instead to represent a set that emerged as somehow the best suited for constituting the proteins of life on Earth. They reasoned that there were various properties any amino acid could have that would affect its suitability as a constituent of proteins. Among the properties were size and electric charge of the molecule, and the molecule's degree of attraction to water (hydrophilicity). What they found was that the 20 amino acids actually occurring in proteins had a wide range of values for each of the properties, and that the range of properties was more evenly distributed over the subset than should occur if selection were random. In other words, the building blocks of proteins appear to be especially diverse in order to accommodate a large diversity of proteins that could be useful in living organisms. Thus evolution in the earliest stages of life on Earth probably favored the availability of many types of building blocks. Abstract: Did evolution select a nonrandom "alphabet" of amino acids? The last universal common ancestor of contemporary biology (LUCA) used a precise set of 20 amino acids as a standard alphabet with which to build genetically encoded protein polymers. Considerable evidence indicates that some of these amino acids were present through nonbiological syntheses prior to the origin of life, while the rest evolved as inventions of early metabolism. However, the same evidence indicates that many alternatives were also available, which highlights the question: what factors led biological evolution on our planet to define its standard alphabet? One possibility is that natural selection favored a set of amino acids that exhibits clear, nonrandom properties-a set of especially useful building blocks. However, previous analysis that tested whether the standard alphabet comprises amino acids with unusually high variance in size, charge, and hydrophobicity (properties that govern what protein structures and functions can be constructed) failed to clearly distinguish evolution's choice from a sample of randomly chosen alternatives. Here, we demonstrate unambiguous support for a refined hypothesis: that an optimal set of amino acids would spread evenly across a broad range of values for each fundamental property. Specifically, we show that the standard set of 20 amino acids represents the possible spectra of size, charge, and hydrophobicity more broadly and more evenly than can be explained by chance alone. This new picture from ESO’s Very Large Telescope shows NGC 3521, a spiral galaxy located about 35 million light years away in the constellation of Leo (The Lion). Spanning about 50 000 light-years, this spectacular object has a bright and compact nucleus, surrounded by richly detailed spiral structure. The most distinctive features of the bright galaxy NGC 3521 are its long spiral arms that are dotted with star-forming regions and interspersed with veins of dust. 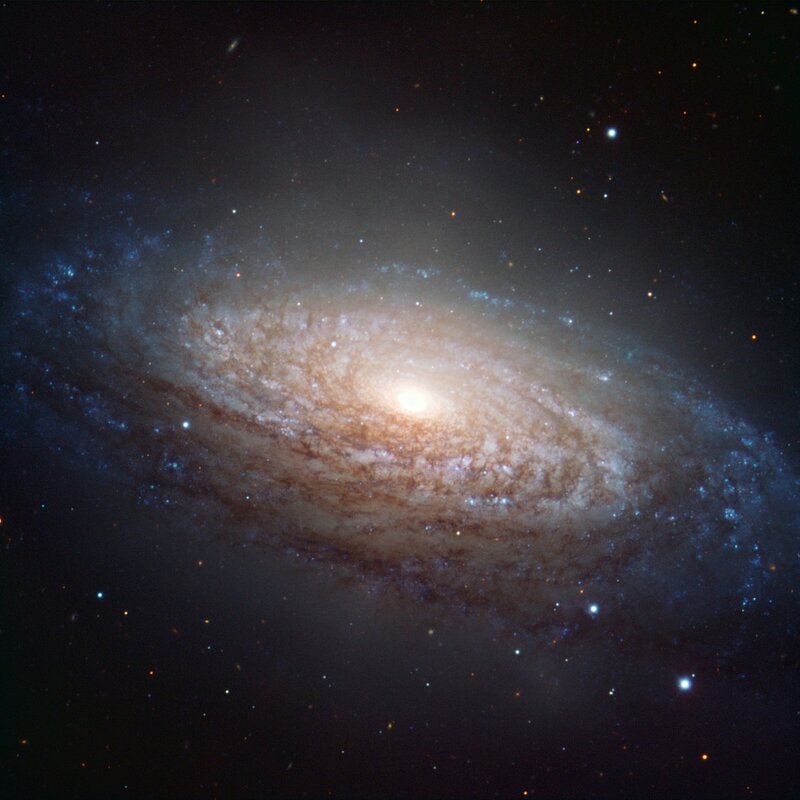 The arms are rather irregular and patchy, making NGC 3521 a typical example of a flocculent spiral galaxy. 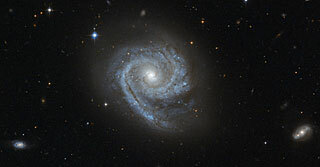 These galaxies have “fluffy” spiral arms that contrast with the sweeping arms of grand-design spirals such as the famous Whirlpool galaxy or M 51, discovered by Charles Messier. Actually, NGC 3521 looks a lot like NGC 2841.